I walked into to John & Waleed, now playing at the Theatre Passe Muraille Mainspace, expecting an afternoon of pleasant tunes from the eponymous creators/performers John Millard and Waleed Abdulhamid, but I was worried that this show featuring “harmonies” created out of “dissonant upbringings” would be too easy on our increasingly troubled times. Fortunately John & Waleed proved me wrong by subtly provoking complicated questions on identity and history rather than placating them. The best way my companion and I could describe the show is to say that it felt like a staged concert documentary. But somehow that doesn’t seem to do justice to the relaxed coffeehouse vibes evoked by the lighting and the performers’ easy-going mannerisms. Just don’t go in expecting a conventional theatrical experience because—while the musical performances are airtight—the talking between songs flowed so freely that it made us question what was improvised and what wasn’t. 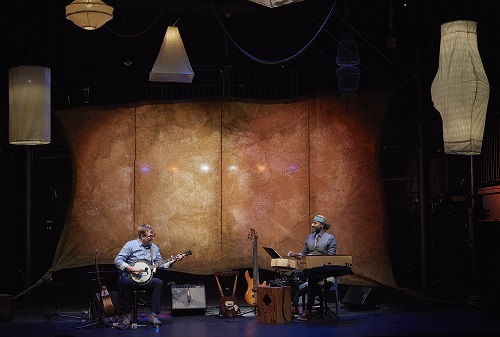 John & Waleed is a theatrical concert with performances from the duo of Millard and Abdulhamid that combines musical traditions from opposite sides of the globe. The truly sensational songs are interspersed with banter and stories about a little bit of everything — from their first meeting and subsequent collaborations to their experiences as travellers and immigrants. Despite the buoyant ease of the show, Set and Costume Designer Joanna Yu’s breathtaking set brought a grandeur that took full advantage of the openness of the Mainspace. The stage is framed by a huge sail that doubles as a projection screen and the ceiling is hung with sailing lines and cloth lamps that references patterns and shapes from Islamic art. The unified yet multifaceted set was a perfect physical embodiment of the intercultural themes of travel explored throughout the show. Indeed, what the production does exceedingly well is show the possibility of unity and harmony between cultures while also acknowledging the important differences in history and privilege: At one point Millard describes how they discovered that although they grew up on different sides of the world, their favourite childhood songs had almost the same progression while, in the next moment, Millard’s account of growing up in Kitchener is quickly upended by a penetrating comment from Abdulhamid about how Kitchener was named after the British Lord that enslaved his people. Director Marjorie Chan should be commended for deftly balancing the show between the two performers and smoothly navigating us from topic to topic, no matter how many worlds apart the stories might be. However, credit must also go to Millard and Abdulhamid themselves who are not only well-suited musically but whose personalities also compliment one another. Abdulhamid’s acerbic wit is often the perfect foil to Millard’s serene banter. However, I did wish we heard more from Abdulhamid at the beginning of the play as it felt like Millard was too often taking the leading role in initiating and guiding conversations. Although admittedly this might have just come down to personal bias because, as a fellow immigrant, I related more to Abdulhamid’s experiences. One such tale about the importance of public libraries to newcomers hit almost too close to home. I also felt like Abdulhamid was sometimes under-served by the technical components of the show. While perhaps the sound and lighting appeared differently to me in the balcony, I found myself wishing several times that Abdulhamid’s mic was turned up more when he was speaking and that his face was better lit. All that aside, John & Waleed is an enjoyable, thoughtful show that has only gained in relevance. It is another great addition to the series of shows I’ve seen this year on Toronto stages showcasing diversity and challenging our notions of the Canadian identity. John & Waleed plays until March 5th, 2017 at the Theatre Passe Muraille Mainspace (16 Ryerson Ave.). Shows run Thursday to Saturday at 7:30 PM with Sunday Matinees at 2 PM. Single tickets are $17-$33 with PWYC tickets available for Saturday and Sunday performances. Tickets are available for purchase online, by telephone at 416.504.7529, or in person at The Arts Box Office. The reviewer notes that she unfortunately arrived a few minutes late into the performance. Photo of John Millard and Waleed Abdulhamid by Michael Cooper.